I am going to dispense with my usual lengthy summary of what President Mulgrew said because you’ve already seen most of it in the UFT propaganda literature or you will hear it when union representatives come to your schools. I continued: “The city is not in bad shape financially so why are we settling for so little. If we take out the 4% + 4% for the first two years that just equals the last pattern (and we won’t see until between 2015 and 2020), the pattern we set for the rest of municipal labor is 10% total over 7 years.” That is the worst pattern in municipal labor history (at least as long as I have been around).” At this point, Mulgrew stopped me and said I was wrong. I responded that according to Robert’s Rules when I have the floor, he has no right to interrupt me. Mulgrew and UFT leadership from Unity caucus wasted this time violating process, instead of letting those against the contract speak. * Changing the use of the 37.5 minutes. By my count, the extended time provision has been reconfigured 6 times since it went into the contract in 2002. What makes anyone think this change of two days of professional development and parent outreach will be better than the tutoring or other uses of extended time? It is not a gain. * Merit pay or career ladder. The ambassador teacher, model and master teachers just creates different classes of teachers. It flies in the face of union solidarity. We are one union. Funny how there is money for merit pay and the hard to staff school differential but not for our raises. As for the argument that it isn’t really merit pay, paying select teachers more than their peers is merit pay. Don’t they need to be highly effective or effective which means it will be based in large part on student test scores? If it walks like a duck and quacks like a duck, it usually is a duck. * Weaker tenure for ATRs. Two documented occurrences of “problematic behavior” and we are in a 3020a hearing. This provision divides the union into two types of membership; regular and ATR. It’s antithetical to union solidarity. We are one union; we should have one tenure system for all of us. If this new system for ATRs is so good like the President says, why not give it to everyone? How can one argue this isn’t worse than a major giveback? The contract is bad enough on its own. We don’t need to say anything that isn’t true. This is what UFT Welfare Fund Director Arthur Pepper said on healthcare. Arthur Pepper reported that the UFT found the necessary savings the city wanted so there will be no effect on members. We will have the same access to doctors, hospitals and the drug plan won’t change. There will be no premium for members. Sadly Leroy Barr’s mom passed away so our thoughts and prayers go out to Leroy and his family. Join us Saturday May 10th 12-3pm 224 West 29th st NYC 14th floor to discuss the contract, learn more details,and plan our vote no campaign because we can do better! This is definitely a career ladder and NOT merit pay! What’s the difference with lead teachers, mentors that we currently have or literacy, math or technology coaches that were in the Chancellor’s District? Teachers were paid more for extended day and being in hard to staff schools! How can we shout we want a ladder and not put anything in place to create one? Let’s at least try new practices until we get something that works! Everyone can’t and don’t want to be principal’s or APs. You wrote that the union loaned money to the city in 1991. There’s no agreement to lend money this time around, therefore interest in that context does not apply. Not necessarily. Pages 27, 28 and 30 of the Memorandum state “Postings will require an Effective or Highly Effective (or Satisfactory rating where applicable) in the prior school year for eligibility”. With “Merit Pay”, teachers who earn salary raises for maintaining strong test scores (generally speaking) remain as classroom teachers, with no additional responsibility. “Master Teacher”, “Lead Teacher” and “Ambassador Teachers” require one to not only perform their daily teaching responsibilities, but also perform *additional* work in their building. Again, not entirely true. Page 39 of the agreement states that “…the hearing officer shall determine whether the ATR has demonstrated a pattern of problematic behavior”. *Pattern* is the key word. In addition, page 39 in reads, “If within a school year or consecutively across school years, an ATR has been removed from a temporary provisional assignment to a vacancy in his/her license area by two different principals because of asserted problematic behavior…”. Key word: *consecutive*. c) create an opportunity to establish a stronger rapport with parents. Curriculum is at the forefront of what’s making our working conditions so tough. If a principal does not provide a teacher with curriculum for their core subjects, a grievance can be filed. Many teachers who started before the Bloomberg era remember what it was like to visit a mentor / teacher with a great deal of experience and content knowledge. I was grateful in my first year of teaching that my mentor had almost thirty years of experience. The inter visitations he arranged for me with other senior teachers were invaluable. He had release time (one less teaching period per day). When he retired, I thanked him for all that he had taught me. He thanked me for reigniting the passion that he had for Shakespeare and poetry. Although I am not going to apply for one of these positions, I like the idea of a career ladder for those who do not want to be an AP or principal. I respectfully disagree with the contention that this is merit pay. Teachers should be compensated for hours spent (like coverage pay or per session pay) for the extra work they do. Teachers also learn more from observing other teachers rather than simply discussing what an administrator observed. I respectfully disagree with you James. Although you disagree with my vote of Yes for this proposed contract, I hope that teachers apply for these three career ladder positions and mentor the next generation of our New York City public teachers. I have never heard people not wanting to have mentor teachers in their schools. I think it is very important that all teachers have the ability to go to mentor teachers to develop their craft. and I also think it is important that these teachers be respectfully compensated for the extra time and energy they put in. This isn’t merit pay at all. Merit pay are bonuses, these new positions give added responsibility to mentor other teachers, and collaborate with their colleges. 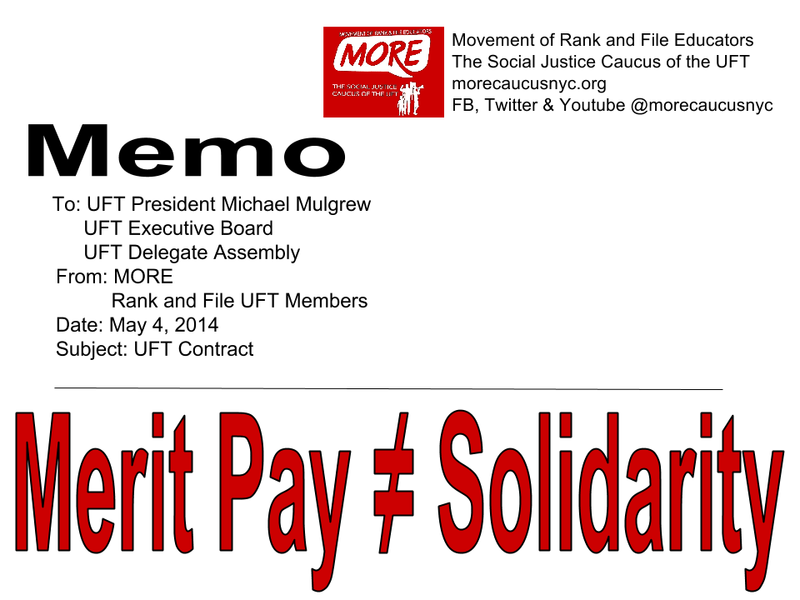 And with all of the added responsibility I applaud the UFT for making sure they are compensated for their time. They have had mentors for years and they were always on the same pay scale. This is just merit pay in disguise. Vote NO.